Beef and peppers is one of my favourite takeout foods. While beef and peppers tends to be one of the takeout menu items that is lower in saturated fat and sugars, it can still be very high in sodium. Using low sodium soy sauce and no salt added beef broth will keep the sodium content to a reasonable amount. This recipe is packed with vitamins A, B6, B12 and C, and very high in iron. 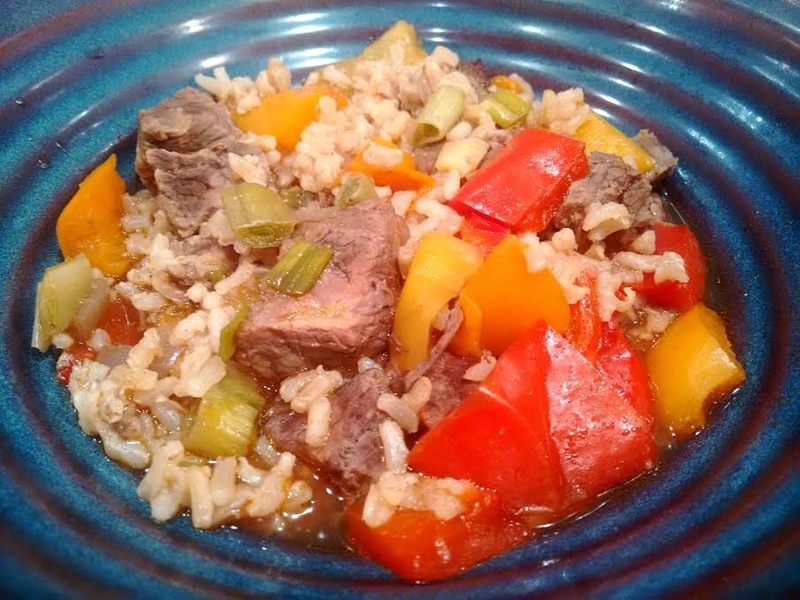 While the slow cooker isn't the usual way to cook this dish, I love being able to throw the ingredients in and walk away from it for a few hours. I also love it when I get home from the gym (I'm really hungry) and lunch is ready and waiting for me! I added instant brown rice directly to the slow cooker, but if you prefer to cook rice separately, leave out the water. Note: You can either cut the beef into bite sized pieces before cooking and cook it for 3 hours on high, or you can put the whole cut of beef in for 8 hours on low and then shred it with forks after it is cooked. Place bell pepper pieces in the bottom of the slow cooker pot. Add beef cubes, then season with salt and pepper. Add sriracha sauce on top of beef. Place green onion, red onion and garlic on top of beef. Pour soy sauce and beef broth in to cover all ingredients. Cover and cook on high for 3 hours or low for 8 hours. Optional for instant rice: Add water to slow cooker with soy sauce and broth. When there is 30 minutes remaining on the cooking time, pour instant brown rice in to slow cooker and stir to cover rice in liquid.